This little turtle scratcher was a gift from our friend Kim. 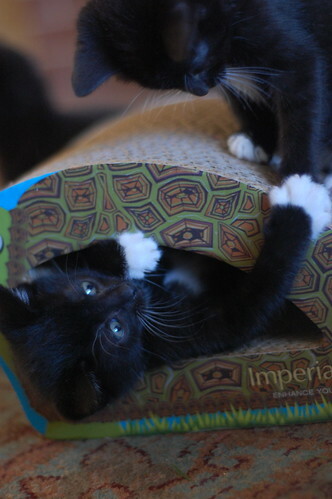 It's fun to scratch on, it's fun to climb on, but Thurston thinks it's REALLY fun to climb into it. He'll hang out there and wait for his sisters to pass by and then he'll pop out and try to startle them. The girls love the game too, and and will gladly play along. Love the big paws! Thanks for sharing all of this cuteness. It is always a guaranteed stress reliever! Oh, Thurston. I definitely see why Lovey couldn't resist you!!! He better enjoy it now. Soon he won't fit there any longer! Can't wait for the day he tries that and doesn't fit - boy won't he be surprised. :) Ahh...the joys of being little!! 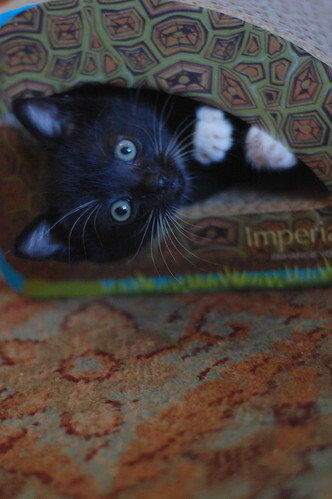 Yay for happy, playful Thurston! He's no cry baby!! He has the cutest paws EVER! Such wide little eyes--adorable! I want him. Truly Terrific Thurston....you are a dear. Yup, that is already looking like a pretty tight spot, sweetie! Enjoy it while you still can! I can't stop looking at that first picture, especially... so sweet!! 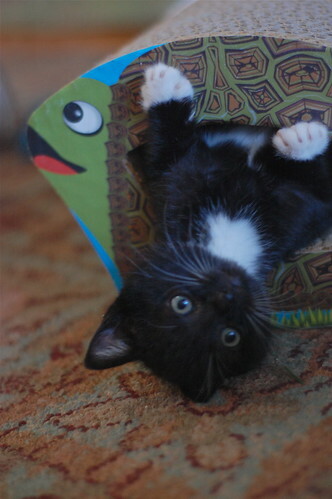 Little Mr. Upside-Down in his turtle, with his adorable white mitts, and a look that says "won't you play with me"? Yes, Thurston, I will play, yes yes!!! That top picture is SOOO adorable!